The strength of our company lies in the men and women who work for it. Below, you will be able to learn more about our professions and hear from the people who make our company tick. If you would like to be part of our Group, we suggest you consult our job offers or send us your spontaneous application (French language sections). Our Human Resources policy is in line with the company’s undertakings in terms of security, quality and the specific professional expertise of our teams. Fulfilling these undertakings leads to the possibility of advancement within the Group. The CIM-CCMP Group places particular emphasis on training its teams, especially as far as safety and security are concerned. CIM-CCMP devotes more than 4% of its payroll to training. CIM-CCMP is a member of the French Association of Petroleum Industries (Ufip), an industry association for companies operating in France in one of the oil and gas industry's three major segments: oil and gas exploration & production, refining and marketing. My name is Yann Pouliquen and I joined the CIM-CCMP Group in June 2009. 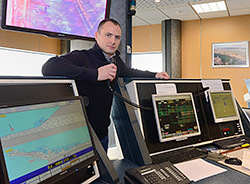 Director of Operations and as such in charge of planning operations within the Le Havre and Antifer oil terminals. Under the supervision of the Director of the Operations Department, I schedule operations in relation to instructions received from our customers and draw up instructions for the tasks to be carried out by the shift teams. My role is to remain attentive to our customers and always be ready to adapt our logistics in order to meet their needs. I make sure the shift teams that I supervise carry out the necessary operations to fulfil the customers’ orders in strict compliance with Quality, Health, Safety, and Environment management regulations. Our round-the-clock operation means that instructions have to be drawn up on a daily basis. Consequently my job means working to a pre-established schedule that includes some weekends and national holidays. During the performance of my job, I work both in the office and in the field. outside the company: different people at the Le Havre Port (the Port Authorities at the Grand Port Maritime du Havre, shipping agents, the harbour masters, the Customs authorities, and inspection service companies) as well as our different customers. inside the company: I am in contact with the different works and security departments in order to ensure that the daily technical operations are performed at the facilities in the utmost safety. Having spent 16 years working for shipping agents, during which time I climbed the ladder and was promoted to shipping agency manager, I wanted to have a new challenge and the opportunity to develop my career. Although CIM is the leading independent French oil storage company, it is a very people-friendly company and working here gave me the possibility of working in a major company while remaining close to the maritime environment of which I am so fond. The profession of director of operations in charge of planning requires good management skills, precision and organization. I have to be able to handle priorities in relation to customer requirements and work well in a team. After initial training in international transport, I specialized, right at the beginning of my career, in maritime transport and oil logistics. Since joining the CIM-CCMP Group, I have continued training essentially through a buddy system. Training provided outside the company has not only enabled me to gain a solid foundation of the profession but also to remain informed of any developments in statutory requirements in the running of a Seveso site. My shipping agency experience enabled me to cut my teeth in the field of management as well as to acquire a keen sense of responsibility and customer service. My name is Julien Hils and I have been a CIM employee since 2006. I am a shift wharf operator and, as such, I am the first point of contact between CIM and the berthed vessel. I work under the Shift Manager. My duties consist in managing the loading and unloading of the vessel at the wharf, taking samples of products and ensuring that all operations comply with security, safety and environment management procedures. 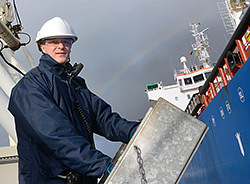 I am present both when the vessel docks and during loading arm deployment; I control the comings and goings of personnel going on board the ship. Working directly in the field, my job is closely related to the schedule of the Le Havre and Antifer terminals and I work shifts: from 7am to 7pm, or from 7pm to 7am. Not only do I work alongside CIM colleagues, but also with people from outside the company: port officers, crew members, boatmen and pilots. I joined CIM because it is a leading company in the Le Havre region. It is important to be thorough, vigilant and understand all the procedures when carrying out the duties involved. Having first trained as an electrical technician, CIM was my first employer. In-house training given by the CIM-CCMP Group has enabled me to acquire the knowledge and skills of this profession and to put this into practice in compliance with Quality, Heath, Security and Environment management procedures. 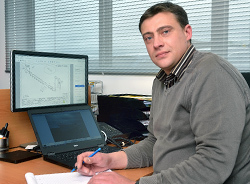 My name is Cédric Guyon and I have been working at CIM since 1996. 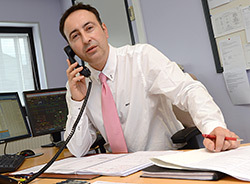 I am a general operations agent working under the Group’s Director of Distribution Depots and the Grigny Depot Manager. The four key tasks in my job are to guarantee safety of both people and goods on the site, to ensure that customers have access to a continuous supply of products, to monitor quality within ISO standards and to make sure the facilities are correctly maintained. I am based at the Grigny site and I work morning or afternoon shifts. Although I am a general operations agent, my core profession is in the control and maintenance of the site. I worked as a sub-contractor and enjoyed working in this field, so when an opportunity arose to work for CIM, I jumped at it. Given the nature of our business, the main requirements of my job are to be meticulous and thorough. After I was hired, on-site training proved to be essential especially with regards to security, the issues of which I was already aware due to my previous employment as sub-contractor at the site. My name is Adeline Feldman and I joined CIM in 2006. I am in charge of the Occupational Safety and Health department and work under the direct supervision of the Le Havre and Antifer Oil Terminals Director. My duties cover various divisions and I work closely with the Company’s Operations and Works departments. I supervise two divisions on a daily basis: the safety division and operations/maintenance division, which together comprise 50 or so employees. The security division deals with the broader aspects of running a Seveso site, from monitoring the facilities and managing safety equipment to controlling access to the sites. Our priority is to ensure that regulations governing security and safety of people, facilities and the environment are fully complied with. The operations/maintenance division ensures the day-to-day maintenance of the facilities and backs up the shift teams if necessary, both from the point of view of security and general operations. I am a Port Facilities Security Officer dealing with port security and the prevention of unlawful acts and as such I ensure that regulations falling within the scope of the International Ship and Port Facility Security Code (ISPS) are strictly applied. During the performance of my duties I work in the office and maintain permanent contact with the sites. I am regularly in contact with Government services that supervise our activity, such as the Prefecture, Fire Brigade and the Port of Le Havre authorities. I had the opportunity of discovering the CIM-CCMP Group in 2004 during a 1-year block-release training programme when I was preparing my Master’s diploma in Security and Industrial Risks Management, which I obtained after a PhD in Chemistry. After working for a while in a hazardous waste disposal company, I wanted to join the teams at the Le Havre and Antifer Oil Terminals in order to place my expertise at the service of a company where security and safety are core values shared by all. The position of HSE manager requires a great deal of involvement, an interest and curiosity in all the Terminals’ activities. It is important to be thorough and vigilant as working on a Seveso site demands a keen sense of responsibility and a developed culture of security. It is also essential to be a good leader in order to encourage all the departments, teams and personnel to involve themselves in an approach of prevention and security. 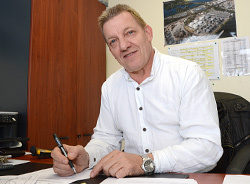 My name is Christian Magne and I have been working in the company since 2001. I am Manager of the Mitry Mory depot. The Manager of an oil depot is the spokesperson and coordinator of operations between the CIM-CCMP Group and its customers, administrative departments and exterior entities. He guarantees that security regulations are implemented for the safe operation of the depot. 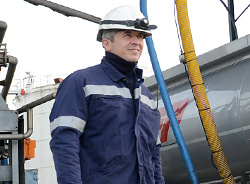 This profession requires a great deal of thoroughness and vigilance when ensuring that all the site’s operations are carried out correctly: loading tanker trucks, Trapil feed supply and monitoring exterior companies. It is important to possess – and to develop – a culture of security that is conveyed to the teams and to demonstrate a high capacity for teamwork. I work at the Mitry-Mory depot just a few kilometres from Charles de Gaulle airport. The depot is open from 4:30am to 7pm and I am on site from 8am to 6pm. My working hours can change according to workload requirements. I spend my time both in the office and in the field. I have known the CIM-CCMP Group since 1977 when I was working on the NATO Pipeline, for which part of the supply came from CIM at Le Havre. After spending 10 years working on the pipelines I came to work in the storage and distribution depots. I have been Depot Manager in France and abroad. In 2001, CIM were looking for a Depot Manager for their Nanterre site, and without any hesitation I applied for the job. This position requires a developed sense of motivation and interest in the oil industry as a whole. It is important to be thorough because supervising all the site operations involves great vigilance; managing a Seveso site means having an appetite for responsibility and a highly developed culture of security. The Depot Manager coordinates the team, which involves being a good team worker and having good management skills. Technical and management training as well as solid experience in the oil industry are also necessary. Changes in statutory regulations and developing market trends mean that the depot manager must keep his finger on the pulse and be permanently ready to learn. My professional experience as a whole has enabled me to acquire a developed sense of responsibility and broad knowledge of risk management and team management. This has enabled me to feel quickly at home in my role as manager of a Seveso site. My name is Guillaume Marical and I have been working at CIM since 1998. I am a Shift Supervisor. I work under the Operations Planning Managers and am in charge of a 30-man team made of up operations, security and technical services staff. My duties involve organizing the breakdown of different tasks and allocating these tasks to my team in order to ensure that operations run smoothly and are compliant with instructions given by the Operations Executive. I represent CIM on board the ships. I also ensure, along with my team, site security and safety. Finally, in liaison with the human resources department, I participate in managing the skills of the staff I supervise. 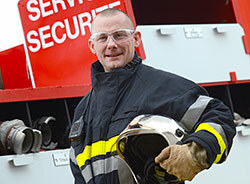 I am based at the Le Havre Terminal and work a 12-hour shift, either day or night. I mainly work in the control room, but I remain in permanent contact with people in the field. I am in direct contact with all CIM colleagues as well as people from outside the company but who work in the Port, such as the Harbour Master’s office, the pilots, boatmen, shipping agents and inspection companies. I wanted to be part of the CIM-CCMP Group because of its strategic importance in this sector in a region where the oil industry is a major component of the economy. My arrival at CIM took place as part of a block release training programme when I was studying for an advanced technical diploma in electrical engineering. My career within the company has enabled me to train at a variety of technical and operational positions, including in management roles, all of which has meant that I can, today, hold this high responsibility job that requires dynamism and organizational skills. My name is Mickaël Lefebvre and I have been working at CIM since 2002. I am a Security Officer. I work under the Shift Supervisor, the Group Manager and Security Foreman and am part of a team that implements Health, Security and Environment management procedures. I ensure that safety regulations are enforced; as such I check that work sites comply with safety regulations in effect at the Terminals. I audit personnel from exterior companies under procedure improvement guidelines. I am also responsible for monitoring safety material and equipment maintenance. The Le Have and Antifer Terminals operate 24 hours a day and 7 days a week. I work 12-hour shifts in a team, from 7am to 7pm or 7pm to 7am, and am mostly in the field. I am in contact with the CIM teams as well as with employees from exterior companies. As a volunteer fire-fighter, I wanted to join the security teams at CIM in order to pursue my vocation within a professional environment, in a company where the culture of security is deeply rooted and where the means made available enable me to correctly perform my duties. A Security Office must be thorough, attentive and conscientious. My training as a volunteer fire-fighter was decisive in obtaining this job as Security Officer. Then, in-house and external training courses organized by CIM have enabled me to advance in my profession and acquire new knowledge and skills that have helped develop my career. 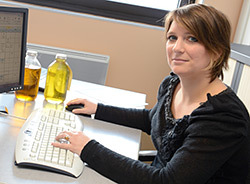 My name is Marie Le Guennec and I have been an employee of the CIM-CCMP Group since 2009. I am a Quality Manager in the CIM-CCMP Group’s Port Terminals and Distribution Depots. I report to the Director of each of these divisions. My role is, above all, to suggest improvements to the company’s quality policy, and to ensure that this policy is communicated and applied at all levels. It is, therefore, my responsibility to organize, handle, coordinate and have expert knowledge of the quality system in order to be able to ensure its effectiveness and therefore ensure customer satisfaction. The third activity, which is essential in the successful performance of a quality system, is coordination and communication. This involves training personnel and communicating the company’s “Quality” values. Finally, there is what we call “quality assurance”: this means managing and improving the quality document system, keeping the applicable statutory texts up to date, scheduling and managing internal audit activities, and monitoring preventive and corrective measures. This falls within the scope of ISO 9001 certification. Outside the Group, I am in contact with customers and certification organisations. A Quality Manager must be organized, thorough and convincing and it helps to have good people skills and a developed sense of analysis and an ability to see the big picture. It is also necessary for a quality manager to have varied and diverse knowledge and skills because the job covers transverse fields. My higher degree in Quality Management associated with the vocational training that I have received since beginning my career have enabled me to acquire extensive knowledge of standards and quality tools as well as management and communication skills. Experience acquired in other companies also plays a role in on-going improvement, which is one of the cornerstones of the ISO 9001 standard. I am able to draw on the best practices used in these other companies. I chose to join CIM-CCMP as the Group’s senior management has made a major commitment to quality and is involved with and encourages quality measures on a daily basis within the company. I am also attached to the enrichment that working with such diverse sites brings as well as this large Group’s people-friendliness. My name is Laurent Fourreau, I joined CIM in 2014 and I report to the Works Department Manager. I am responsible for the monitoring and maintenance of pipelines, tanks and mechanical equipment. My main tasks include guaranteeing the availability of equipment, carrying out the monitoring and maintenance thereof and completing projects to develop the production facilities. This role includes monitoring and preventive maintenance tasks and intervening during technical stoppages. All of these tasks are performed in connection with a number of external companies, where interpersonal aspects, at a technical and commercial level, have an important role. Working at an upper-tier Seveso II site requires vigilance and sound coordination with the Safety Department so as to ensure compliance with Hygiene, Security, Safety and Environmental constraints. Regular contact with administrative authorities also ensures compliance with regulations in the context of technical directives and building codes. Having trained as an Engineer at Arts et Métiers ParisTech, I have primarily held the role of Project Manager on behalf of customers, with a strong emphasis on human, technical, economic and organisational aspects. The combination of these activities, performed within a variety of industrial sectors, represents a major advantage which today enables me to carry out the direct and cross-functional tasks related to my role at Compagnie Industrielle Maritime. Today, as a result of its strong maintenance and development investment policy, CIM allows me to complete the projects entrusted to me while guaranteeing high-quality services and compliance with deadlines and safety regulations. Please consult our job offers or send us your spontaneous application (French language sections).